How do God’s spokesmen admit egregious errors? Preachers, priests, pastors and professors are revered for their assumed deep Bible knowledge; but a spectacular mass delusion has overpowered them. Eloquent religious leaders, from Martin Luther in the 16th century to Billy Graham in the 20th, have pounded their pulpits as they issued dire warnings about the imminent end of the world. For hundreds of years, successive generations of Christians have been told that, according to the Bible, the world was about to be incinerated. But planet earth just keeps on spinning and now, thanks to the Internet, everyone has easy access to multiple versions of the Bible. So it’s easy to see that our emperors of eschatology are strutting around naked. You don’t have to be much of a scholar to check out the “heretical” things that I am about to tell you. Here’s a humdinger: “A correctly translated Bible never says that the world will end!” The translation error that created and sustained that delusion was corrected fifty years ago… All of the modern translations (NIV, ESV, NASB, NKJV, etc.) refer to the “end of the age” not the “end of the world.” Jesus predicted the end of the age of animal sacrifice at the temple in Jerusalem, not the end of the world. It seems that pigheaded paperback prophets and pulpit pounders are so bamboozled by their apocalyptic delusions that they feel constrained to ignore the inconvenient fact that the Bible does not predict the end of the world. Here’s another inconvenient truth that our bamboozled Christian leaders cannot bear to contemplate: many times the New Testament writers quote Jesus telling his disciples that he would return before all of them had died (Matt. 16:27,28). He said that he would return before that first century generation had passed away (Matt. 24:34). If he didn’t return, then the Bible is nonsense and if he did return, then all of our “last days” “end of the world” doctrines are nonsense. The New Testament writers repeatedly express their eager anticipation of Jesus’ imminent return. For example the following words were penned almost 2,000 years ago “Yet a very little while and he who is coming will come and will not delay” (Heb. 10 :37). Ignoring clear statements like this, the Bible-believing Pharisees of today insist that he has delayed his coming for 2,000 years. They tell their duped followers that we are living in the “last days” and that Jesus will be coming soon. Three times in the last chapter of the last book of the Bible Jesus said: “I am coming soon!” “I am coming soon!” “I am coming soon!” But he said those words almost 2,000 years ago. If he didn’t come soon, if he didn’t return during his disciples’ lifetimes, then the Bible is nonsense. Twice in its first three verses, The Book of Revelation states that it deals with events that were “about to happen,” and it makes the same assertion two more times in the last chapter. There can be no doubt that the book is a warning about calamitous events that were “about to happen” long ago. Revelation is addressed to people who lived 2,000 years ago and it uses poetic language that those people understood, to reveal events that were about to happen to them. Yet our spiritual godfathers use it to conjure up absurd, dark fantasies about the Antichrist boogieman and the supposedly imminent end of the world. I say again, the Bible never says that the world will end and incredible though it may seem, there is no Antichrist in the Book of Revelation. In fact, there is no such entity as the “Antichrist” anywhere in a correctly translated Bible. There is so much more to say; but that would take a book… and that’s the reason that I wrote Bamboozled Believers. At the beginning of this article I asked: “How do God’s spokesmen admit egregious errors?” The answer is: “They don’t admit any error”. Instead they choose to embrace extra-biblical, manmade dogma and they reject the clear teaching of God’s Word. Why don’t our bamboozled spiritual leaders accept the biblical truths outlined above? Carl Sagan described their situation when he said: “If we’ve been bamboozled long enough, we tend to reject any evidence of the bamboozle. We’re no longer interested in finding out the truth: the bamboozle has captured us. It is simply too painful to admit, even to ourselves… that we have been so credulous.” Our theologians are either too dull or too proud to see their error. 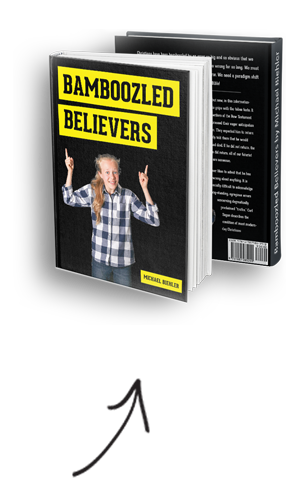 Dear pilgrim, our leaders are bamboozled by their delusion; they cannot admit their errors… So if you would like to actually understand God’s Word, start by reading Bamboozled Believers, it will open up whole new vistas of truth!